If you’re looking to bring your home decor to more of a modern farmhouse style, you’re going to love all of these farmhouse light fixtures I’ve rounded up for you. Swapping out light fixtures is a great way to update the style of your home. 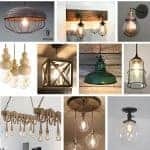 So if you’re looking to bring your home decor to more of a modern farmhouse style, you’re going to love all of these light fixtures I’ve rounded up for you. I found a little bit of everything….we’ve got pendants, vanity lights, plug in lights and some really cool chandeliers too! Believe or not, this awesome pendant light is made from an upcycled vintage chicken feeder. This industrial style lighting would be the perfect addition to any farmhouse style home, or a great fixture for an industrial/loft space. This industrial rustic cage light is a one of a kind light fixture has a neat combination of wood, pipe and vintage peach shape cages. This unique modern farmhouse light fixture will definitely bring that modern farmhouse look to your bathroom. This smoked glass look on this wall sconce is so unique and fun. I love the different finish options that are available. This would look fun on the side of your bed, don’t you think!? This wooden minimalist pendant light is so unique! It’s made with hand-turned pieces made of natural beech wood in a three – scaled geometric round shape. It comes with a fabric cable is of your choice. Love the look of this wooden farmhouse box pendant light. I think this modern farmhouse light would go perfect in an entry way! What a great first impression it would make. This one is all about the color! The vintage green enamel barn light shade was one of those treasures found at a flea market. It is a plug-in pendant lamp with a black fabric 15 foot twist cord with an on/off switch near the plug. Love this pendant light made from a single half gallon mason jar with the bottom cut out. There’s a rust colored cage that hangs over the jar. I love the fact that the jar has a pretty green tint because it is made from recycled glass. If you’re looking for some industrial style lighting, you’re going to love this hanging light. It look awesome above a kitchen island. How cool is this handmade chandelier made out of a three wire whisks attached to a wooden base. Let this unique light fixture bring a modern farmhouse style to your home! It will look great in your kitchen, breakfast area, or dining room. Love the modern look of this glass globe light fixture. I think this modern farmhouse light fixture would look great above a kitchen sink or multiple lights down a hallway. The black and white color scheme is very popular in the modern farmhouse style. This vanity light would look amazing over a wood framed mirror in a farmhouse bathroom…did someone say shiplap? You know how much I love our old faux shiplap wall in our farmhouse bathroom. This wall sconce light fixture fits right in on this list of modern farmhouse light fixtures. It works as an accent in many styles of decor – everything from the farmhouse to the industrial. These would look great down a hallway or on each side of the bed. This is a perfect modern farmhouse chandelier for over an island or over a farmhouse dining table. The five lights in a linear pattern will stretch the light from end to end, giving great illumination. I love the vintage inspired ‘squirrel cage’ Edison filament light bulbs. 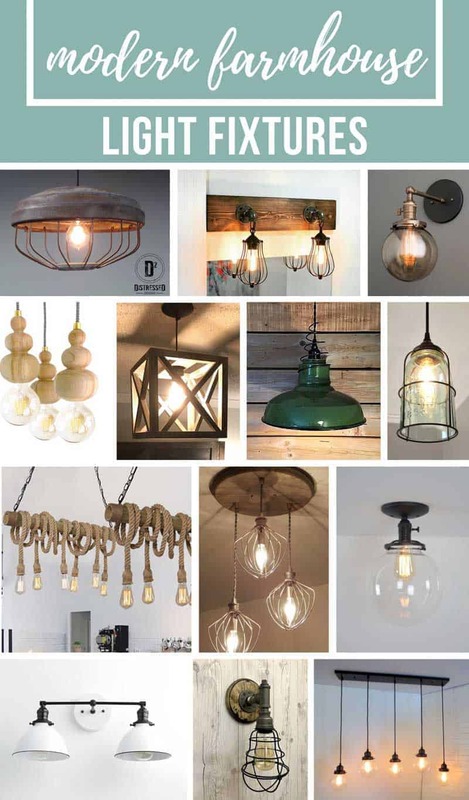 …which of these modern farmhouse light fixtures is your favorite?? 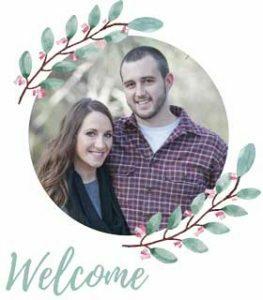 Thank you so much Chelsea for the great feature! !